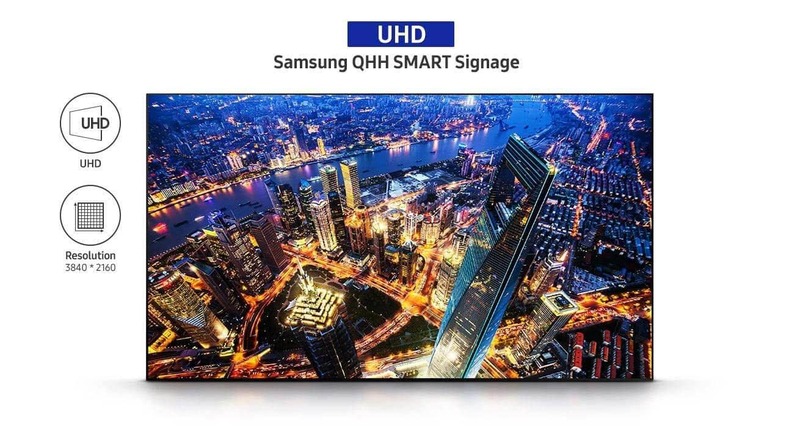 With the introduction of its new quantum-dot powered QHH Series QLED Signage, Samsung has elevated the traditional content experience with more lifelike quality guaranteed to deliver an unexpected viewing environment that resonates. 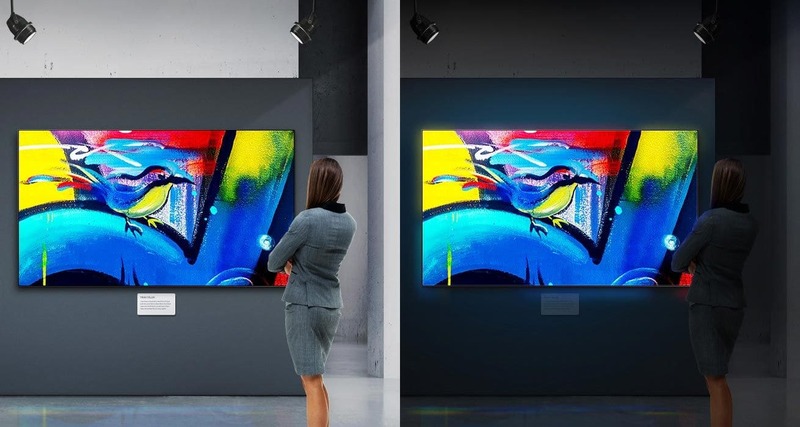 The QHH Series displays can showcase more than one billion colors at 100 percent color volume, and produce deep blacks, pristine whites and sharp hues that make any picture pop. And with portrait and landscape configurations available, businesses can customize the displays to meet their unique operational needs and reach the widest audience possible without any added hassle or expense. 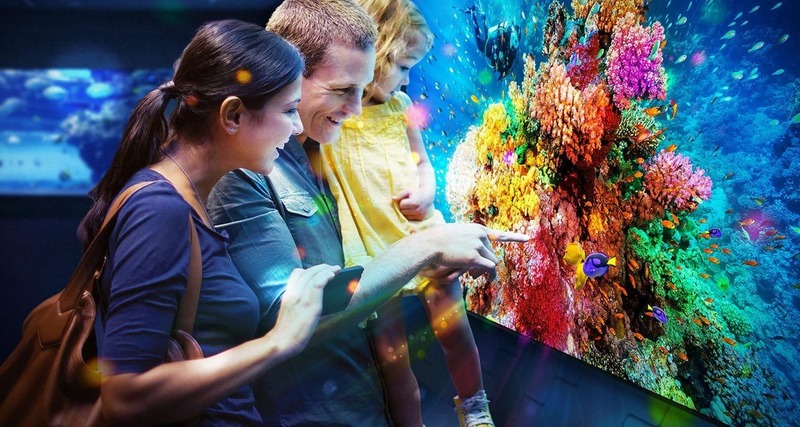 Through this next-generation presentation, Samsung’s QHH Series displays deliver the enhanced brilliance, detail and realism necessary to cut through the clutter and fuel interactive, ongoing business growth. As businesses seek new ways to attract audiences and improve efficiency in increasingly-crowded environments, many are turning to advanced digital signage as a way to break through the clutter. By integrating quantum dot visual refinement technology, Samsung’s QLED Signage offers these businesses an even greater competitive edge. An immersive high-quality picture creates a more memorable, attractive and buzzworthy customer experience. Beyond their external communication benefits, the QLED Signage displays additionally reinforce business branding through accurate and clean logo and color presentation. Through this diverse host of features, Samsung’s QLED Signage is the perfect addition to generate additional revenue and strengthen customer loyalty. Through compatibility with a variety of color spectra, the QHH Series displays achieve 100 percent color volume at optimal integrity for one billion different colors. This enhanced presentation brings even the most subtle visual details forward at varying levels of brightness, and fosters more realistic content within any indoor environment. As a result, retailers and other indoor businesses reliant on true-to-life product presentation can better drive purchase intent and improve customer satisfaction. The quantum dot integration enables Samsung’s new QLED Signage to balance light and dark brightness (600nit in landscape and 500nit in portrait) and preserve gradation for a presentation that is deeper and more realistic than that offered by conventional alternatives. 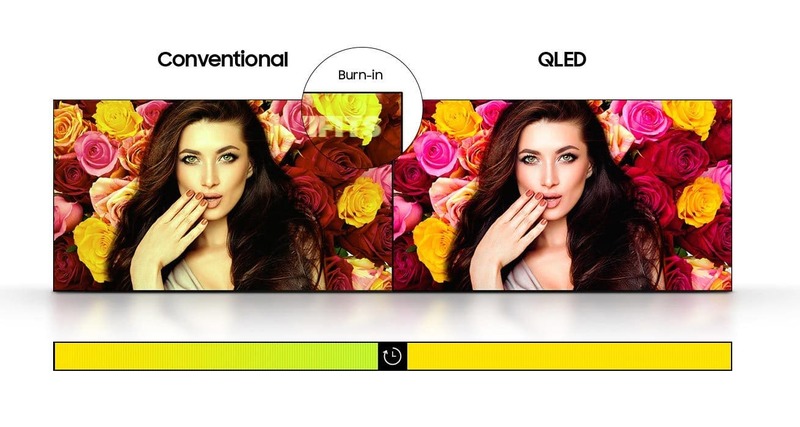 Through enhanced, semiconductor-based picture refinement technology, the QHH Series displays produce deeper blacks, sharper whites and more precise colors for an eye-catching picture that pops. In turn, businesses in any environment can deliver a truly immersive and captivating viewing experience without worrying about external interference. 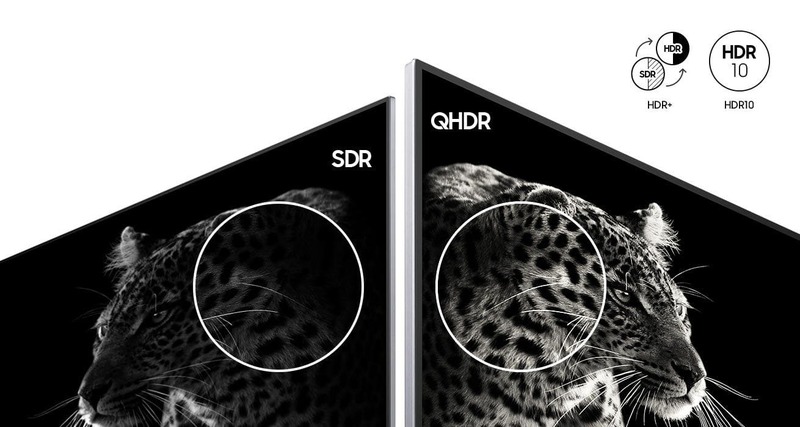 The QHH Series displays leverage HDR picture refinement technology to deliver a range of static and motion content as intended and without compromising visual quality. This includes support for both the HDR10 picture presentation standard and HDR+ technology. Through HDR10 compatibility, indoor businesses can guarantee that all featured content meets ultra-HDR guidelines and reaches customers as clearly and brightly as possible. 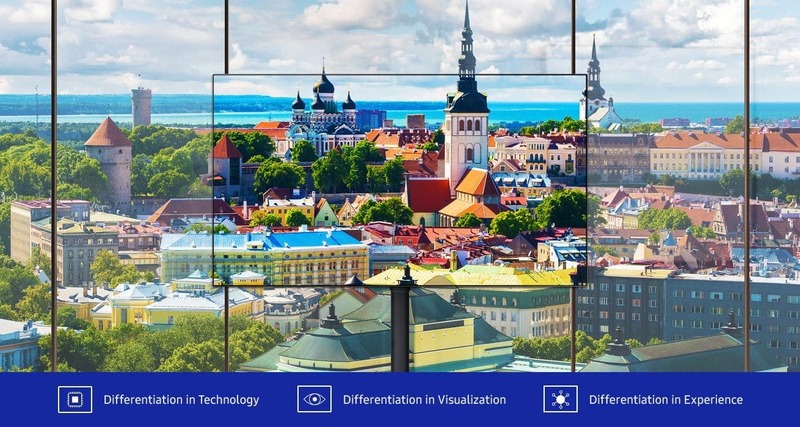 The complementary HDR+ functionality additionally allows businesses to surpass industry limitations by converting standard definition (SDR) content to HDR quality quickly and efficiently. This flexibility grants businesses new opportunities to create high quality, HDR-ready content amplified by sharp contrast, vivid color depth and seamless streaming. 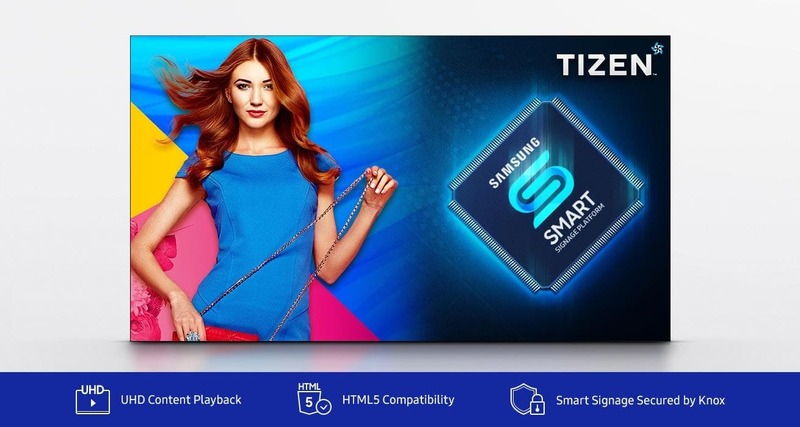 Samsung’s QLED displays are the first in its lineup to feature the fifth generation SMART Signage Platform (SSSP 5.0), powered by the versatile TIZEN 3.0 operating system. Within TIZEN 3.0, indoor business users can elevate content with advanced graphics and achieve true UHD playback through a dedicated quad core CPU. TIZEN 3.0’s rigid three-layer security structure also restricts file data access to a limited user base, and perfectly accommodates government, financial and other information-based businesses reliant on information protection. Durable and reliable, Samsung’s QLED displays provide interruption-free long-term performance to meet the operational demands of various indoor settings. As content progresses, these reinforced displays deter burn-in and prevent potential viewer confusion and distraction. 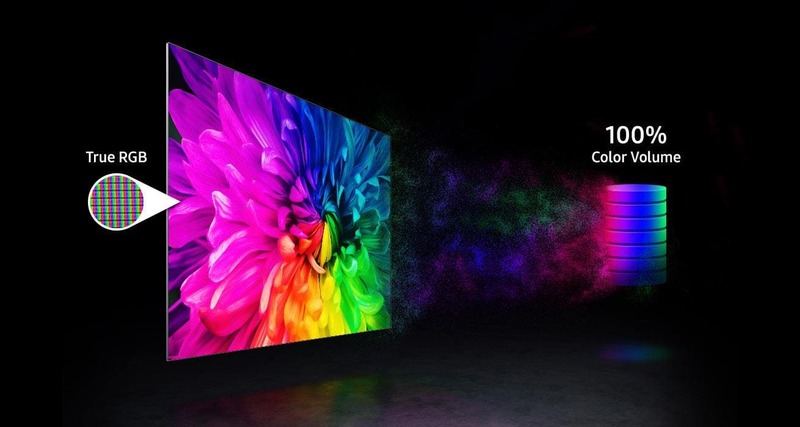 Additionally, each QLED display is engineered to maintain consistent color integrity even during periods of extended use. This maintenance-free consistency allows business leaders to focus on other critical growth areas without worrying about content presentation quality. With a pristine and sophisticated composition, the QHH Series displays add style and ambience to any indoor environment. 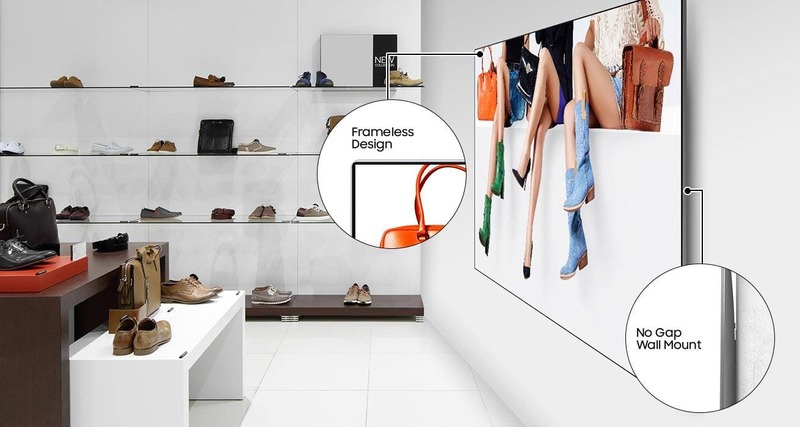 The displays’ frameless design extends the overall available viewing space while ensuring viewers’ eyes remain focused on the featured content, rather than on the display itself. A no-gap wall mount further enables users to cleanly implement the QHH Series displays, all while eliminating a common source of visual distraction and conserving valuable retail space. Featuring state-of-the-art UHD picture quality, the QHH Series displays empower users to create and deliver impactful messaging. Each QHH Series display showcases content with four times the ultra-realistic detail and clarity of standard alternatives, with a wider screen offering more space for text and imagery. When combined with performance features, such as portrait mode and extended durability, the next-level presentation makes the QHH Series ideal for any commercial setting.